Schwerin Castle is a castle located in the city of Schwerin, the capital of the Bundesland of Mecklenburg-Vorpommern, Germany. 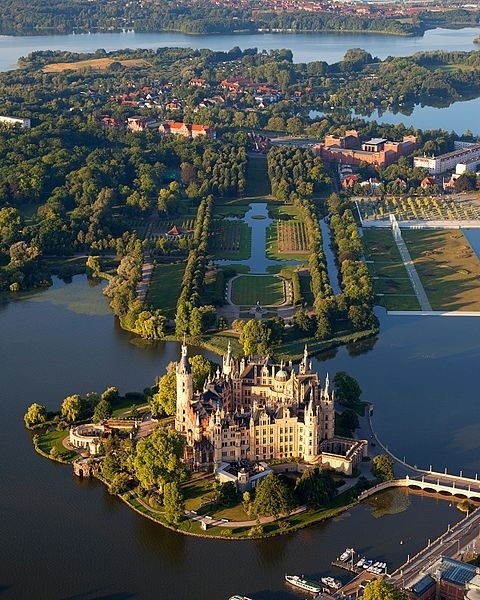 For centuries it was the home of the dukes and grand dukes of Mecklenburg and later Mecklenburg-Schwerin. It currently serves as the seat of the state parliament. First reports of a castle on the location were made in 973. There was a fort of the Polabian Slav tribe of the Obotrites on an island in the large Lake of Schwerin. In 1160, the fort became a target of Germanic noblemen planning to expand their territory eastward under the leadership of Henry the Lion (1129–1195). The Obotrites under Niklot destroyed the fort but left because of the Germanic military dominance. However, the German conquerors recognised the strategic and aesthetically interesting location of the island and started building a new fort. The foundation of the city of Schwerin took place in the same year. Schwerin became seat of a bishopric. In 1167, Henry gave the County of Schwerin to his vassal Gunzelin von Hagen, and the rest of the country around the city was returned to Niklot's son Pribislav, forming a ducal hereditary line that lasted until 1918.